In real life, hipchickindc is licensed as a real estate broker in the District of Columbia and Virginia, and as a real estate salesperson in Maryland. Unless specifically noted, neither she nor the company that she is affiliated with represented any of the parties or were directly involved in the transaction reported below. Unless otherwise noted, the source of information is Metropolitan Regional Information Systems (MRIS), which is the local multiple listing system. Information is deemed reliable but not guaranteed. List Price at Contract: $595,000. Recent Listing is: Here. To see more pics, click the arrows on the main picture. Last week, a reader had asked if I might profile this property, so here you go! Comments for the original Good Deal or Not (GDoN) post were overwhelmingly positive, with praise for both the home and location, as well as a few shout outs from the neighbors. 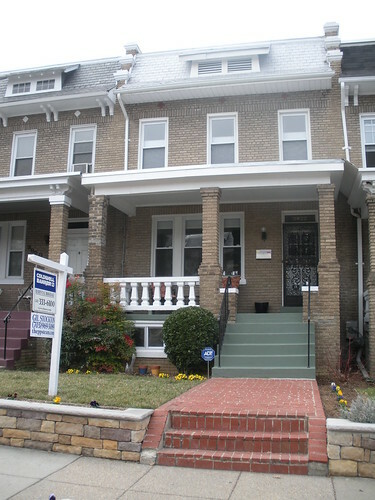 Back during the craziness that was the 2004 DC real estate frenzy, the property went on the market for $225,000. The listing agent noted, “GREAT POTENTIAL ABOUND IN THIS PROPERTY”. The winning bid was $321,500. in cash. Settlement occurred on April 30th, 2004, and it was back on the market in renovated condition on the 17th of November, 2004. List price was $525,000. It was on the market for 18 days and sold at full price with no seller subsidy. The financing was conventional and the buyers at the time made a substantial down payment. In contrast to the GDoN-R home located in Petworth that was profiled a week ago, which was last purchased around the same timeframe, this home showed a gain in market value from late 2004. Considering the $10,000. paid toward closing costs, the net sales price was $575,000., which was at least enough to cover the Seller’s closing expenses. On another note, for anybody who had read my posts about the renovation of Mark and Charles’ home, or is interested in properties to renovate, the Saturday real estate section in The Washington Post (I believe for this weekend) will feature Mark and Charles’ house in LeDroit Park/Bloomingdale.